Make the ultimate homemade frozen treat by mastering how to make a custard ice cream base. Plus, my favorite custard ice cream recipe, and a recovery hack for if you curdle your base! Note: This post has been updated with new content for your enjoyment on June 28, 2018! Why Use A Custard Ice Cream Base? Custard ice creams give you that classic texture reminiscent of old fashioned ice cream; super smooth, thick, and decadent. 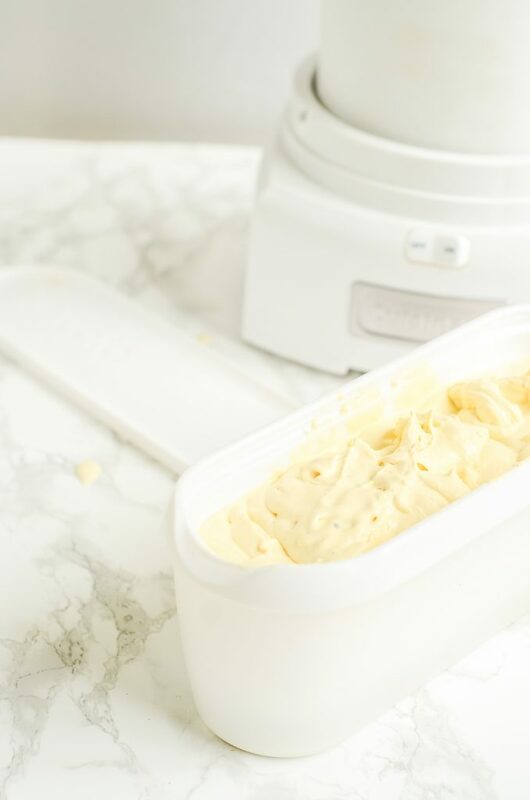 Whether you’re making something fancy, or a classic vanilla ice cream recipe, a custard base will give you the best result! Not to mention, custard ice creams don’t get freezer burnt as easily because the water particles are fewer and smaller and the eggs work as an emulsifier to contain the water. But if you’re wondering if a custard base is worth your time, the answer really comes down to preference. Many custardless ice creams out there are fantastic. In fact, I did a guest post for Cook.Craft.Love last year on a Strawberry-Lavender Ice Cream (it also comes with a fantastic story about my brief foray into kleptomania) that is extremely delicious despite not having a custard base. I would say that more than anything, it comes down to what kind of ice cream you’re making. Custard ice cream is ideal for when you want a super thick, rich, and indulgent ice cream. It’s better suited for the elegant or regal flavors that the custard will help bring out; like, vanilla bean, dark chocolate, dulce de leche, salted caramel, or white chocolate. It’s also nice to use a custard base when you’re adding in flavors that have a high amount of water in them – like peach, mango, or lemon. The most important thing to know for making a custard ice cream is that temperature control is key. There is a fine line between a silky custard and scrambled eggs, so make sure you have a well-calibrated thermometer in you pot at all times. As soon as the temperature hits 180°F, shut off the heat and move the pot away from the burner. If you let your custard base rest while it’s still on the burner, the residual heat can end up taking your base over that fine line. “What happens if I scramble the eggs in my custard base?”, you may be thinking. All hope is not lost my friend, I have a recovery hack that works excellently every single time. 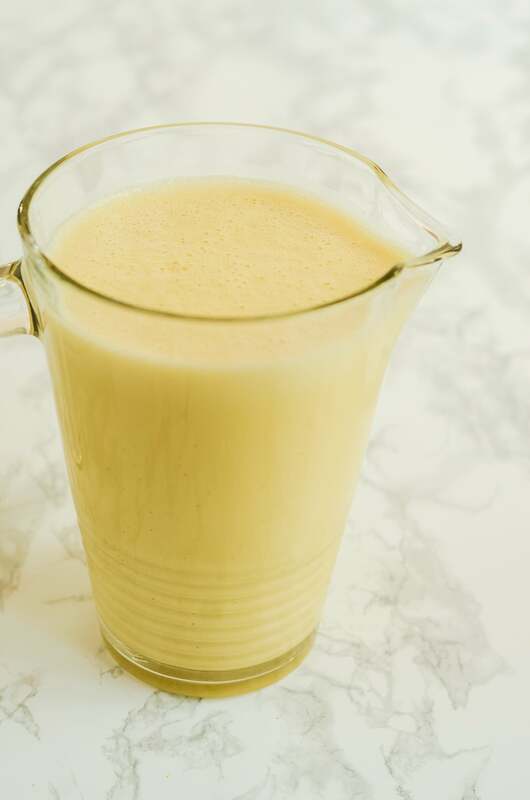 To recover a curdled custard ice cream base: cool the custard to room temperature, place it in a blender and blend on medium-high for 15-30 seconds or until the custard base is once again smooth. Blending your curdled ice cream base will help break down the egg into teeny-tiny pieces so it won’t effect texture. You may find that the flavor of your ice cream is a bit more “eggy” than if they hadn’t curdled, but 9 times out of 10, no one will notice. This is absolutely my favorite way of making custard ice cream. A lot of the recipes on the internet (including the one that I’m putting out later this week) allow for you to just cook the custard base right in the pot. The problem with that is that it doesn’t provide very good temperature control. Using a double boiler gives you more control since the base isn’t directly touching a heat source. It also gives you more ice cream at the end because you don’t lose as much to it sticking to the pot. If you would like to heat it up in your pot instead of the double boiler, no problem. I do still recommend adding the chilled heavy cream at the end to stop the cooking to make sure your residual heat doesn’t overcook your base. Get your free printable grocery list for this Custard Ice Cream recipe HERE. This grocery list has everything you’ll need to make this vanilla custard ice cream base. To make grocery shopping simple, each ingredient is listed in easy-to-find grocery store amounts. If there is no amount specified, that means that you can buy the smallest (or largest) container available and still have plenty left over. Get the best quality and consistency out of your homemade ice cream by using this recipe for the best custard base. This method provides better control over temperature and a rich and decadent end product! Combine the egg yolks and sugar in a bowl. Whip the mixture until it becomes thick and the color turns a light yellow. Scald the milk in a pot, then gradually beat it into the egg mixture. If you add in too much too soon in will scramble your eggs. Take your time. Stirring constantly, continue to heat over a water bath or double boiler until the mixture thickens enough to coat the back of a spoon. Remove from the heat. Immediately stir in the cold cream to stop the cooking. Add the salt and vanilla if using. Chill the mixture for at least 12 hours, then freeze in a ice cream maker according to the manufacturer's directions. 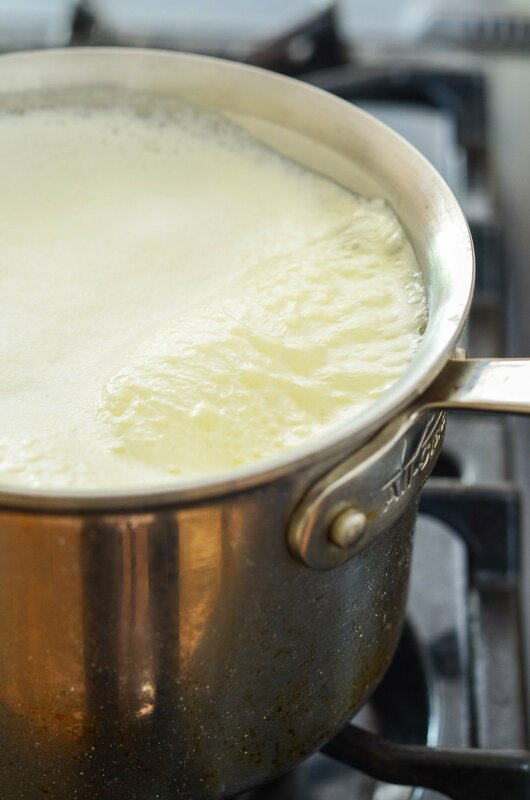 If you are using a container of heavy cream that has previously been opened, make sure to scald and cool it prior to use. This will help reduce the risk of food-borne illness. What a great, well-researched post! I have yet to dip my toes into ice cream making, but this is a great guide for when I start! The ice cream recipe you suggested looks wonderful – I love anything with cardamom! I hope you get to try making your own ice cream soon, Megan. The effort you put into it will definitely be rewarded with excellent creamy dreamy goodness! I had never made custard or icecream before this but this recipe sounded good even if a bit intimidating for a novice. It was amaaaazing and not as difficult as I had anticipated. Nothing curdled, no bits of weird cooked egg it was simply silky and luxurious. I swapped the vanilla out for almond extract and made a gorgeous Rhubarb Custard icecream! It was quite sweet though, I’m wondering if it’s possible to reduce the level of sugar a bit for next time or if that would completely destroy the texture. Regardless I would make this again and try different flavors or just plain…plain would be really good. This just absolutely made my day! I love that you tried something new and that the recipe worked so well for you. Plus, that Rhubarb ice cream with almond extract sounds magnificent!!! Yum!! As for the sweetness – you absolutely could cut it down a bit, I would say by as much as 1/3rd depending on what you are turning the base into. It may change the texture a bit, but mostly in how it freezes. Since you’ll have more liquid in the recipe, the mouthfeel will vary slightly and it will be more prone to freezer burn. I recommend putting the ice cream into a freezer safe container, and then putting that container into a sealable freezer safe gallon bag. That usually does the trick! Homemade ice cream is a must during the hot summer months! I am always curious to see how other foodies make their base and I am for sure going to try your method! This makes such a delightful and decadent ice cream! I hope you like it! 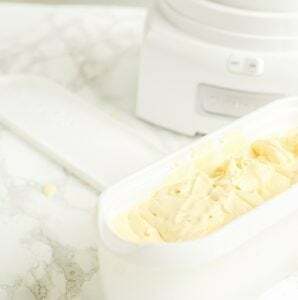 Hello, I love your recipe and I just got a new Ice Cream Maker today. I love buttered almond ice cream, not almond ice cream. How do I make it so it taste buttery? Hi Mary! Thank you for the kind words. I hope you’re loving your new ice cream maker! (Which one did you get?) In my experience, it’s best to make “buttered almonds” rather than almond ice cream with butter. The butter in the roasting process will bring that flavor into the ice cream. I also prefer to use Amaretto with almond extract. It doesn’t overpower the buttery flavor the same way. I was interested in what you said around the butter being introduced during the roasting. Are you saying you would just roast the almonds with butter to create butter almond ice custard. I am about to try a butter pecan other times I have had issues incorporating the butter in the recipe with our it becoming butter droplets. Hi Todd! That’s exactly it. If you roast the pecans with the butter, the butter flavor will get nice and toasty on the nuts and then dissolve into the custard base when you make the ice cream. I find it’s the easiest way to get the butter flavor while avoiding the butter droplets you mentioned.